Infosys is no stranger to IoT – they’ve been an innovator for years and we’ve been covering them as they've blossomed. In 2016, our sister-site IoT Evolution wrote about the company’s analytics platform and how it was supporting Massachusetts General Hospital MD. We further reported how the company is getting more entrenched into the IIoT space. 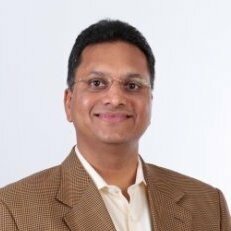 We just caught up with Anurag Sinha, SVP of Comm, Media & Entertainment at the company and got an update on where the company is headed in the space. Some of the example markets cited were oil rigs and healthcare. The company has invested in “design thinking” and they are applying it across industries. They are creating 10,000 new jobs in the US to focus on this and they have multiple innovation centers in places such as Indianapolis and North Carolina. Sinha exclaimed, “Design thinking lets us identify problems of the future.” He continued, “Things you can’t identify individually.” He went on to explain how they are establishing a rich ecosystem with customers, industry, academia and partners to try to solve these initiatives. “This allows us to look at the world from a different lens,” he concluded. Of course this sounded so good but was highly theoretical.Infosys is a systems integrator so I decided to ask for an example. The one he gave was pretty interesting as it involves truck-rolls, an area every carrier wants to reduce. The cost for one of these ranges between $100-$210 depending on location, carrier, etc. He said, they are transforming dispatch by automating scheduling and equipment logistics to ensure the techs don’t have to return to the warehouse to pick up equipment. Moreover, he said some problems they have found don’t need truck rolls and this is another area of savings for customers. They believe carriers will see a 50% reduction in truck roll cost as a result of their Nia AI platform. Another area where they have focused is making a digital twin of airplane landing gear via sensors in order to allow them to predict failure and fix issues sooner. He explained, many companies spend millions to ensure equipment is working at the right performance levels and they help extend the life of these assets. Cross-industry knowledge is another differentiator the company brings to customers as they can take their knowledge from retail and apply it to carriers as an example. 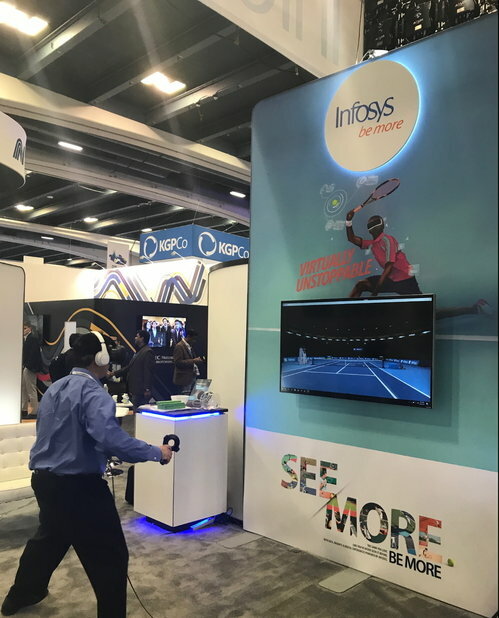 Training is yet another area they focus on and in a demo they allowed us to participate in, they had uploaded the data of every tennis game played by a number of professionals. Their algorithms then crunched this information allowing a digital replica to play you and respond as closely as possible to the target player. The equipment needed was a handheld controller and a VR headset. It was incredibly realistic by the way. We had a chance to play and believe or not, you feel a loT thinner in the VR world than you don in the real world. In this way, players are able to get a sense of what they’re dealing with before they get on the court. Another differentiator touted was the extensive training employees go through – four months in India and four weeks in the U.S. In hindsight we should have asked why the difference but we imagine cost has something to do with it. One final point was the focus on partnerships with academia – in particular is one with Purdue University who will provide classes and training for many of the 10,000 employees the company plans to hire in the United States. While many "experts" in the world tell us incessantly that AI and robots will take our jobs and as a result they need to rescue the free market with a different political system, Peter Theil in his amazing book Zero to One outlines how AI can be used to increase and augment the job market. Applying analytics to myriad real-world problems to make airplanes safer, carriers more productive and factories more efficient requires an army of workers. Yes, automation will reduce the manual labor required in various industries such as telecom engineers but in doing so, much of the capital saved will is naturally reallocated to new companies and business ideas which will create jobs in ancillary and other markets. We are really entering a new wave of industrial revolution which will be fantastic to behold.